Age: Late Pre-Cambrian (approx. 750 million years). Oppdal slate represents what was originally a homogenous sandstone formation, which was deformed through horizontal movement in the earth’s crust during the formation of mountains in the Caledonian period and metamorphosed into slate. Its cleavage qualities are defined by regular, smooth layers of flaked micas. Sheet thickness varies between 10 and 60mm. Workable slate occurs in several parallel zones, each of which can be up to 20 metres thick. The lower zones consist of light to mid-grey Oppdal slates. Dark Oppdal slate and Golan occur in the upper regions. 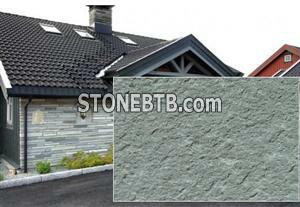 The slate is somewhat more porous than, for example Alta slate, and occurs in thicker strata. On the other hand, Oppdal slate can be easily scored and cut, and it is therefore well suited for use in walls and products with unfinished edges. The surface and colour of unfinished slate varies somewhat with this rock type, and when polished the colours and patterns can vary a great deal. china granite with good quality and resonable,our company offer the manufacturing service.